Herbs. Stems annual, erect, 0.2-0.6 m, herbaceous, glabrous, glaucous abaxially; prickles absent. 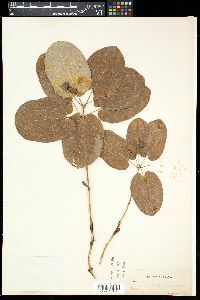 Leaves few, approximate distally; tendrils absent; blade ovate, 6-15 × 1.5-8 cm; glabrous and glaucous abaxially, base cordate, margins entire, apex acute to acuminate. Umbels 1-few, proximalmost axillary to leaves or bracts, few-flowered, open; peduncle 5-10 cm. Flowers: perianth greenish; tepals 2.5-3.5 mm; anthers longer than filaments; ovules (1-)2 per locule; pedicel slender, ca. 1 cm. Berries black to bluish black, globose, ca. 8 mm diam., not glaucous. 2n = 26. Flowering May--Jun. Rich, open woods in ravines, along streams, and at bases of bluffs; 0--1500 m; Ala., Fla., Ga., Ky., N.C., S.C., Va. Smilax biltmoreana is distinguished by its ovate leaves with glabrous and glaucous abaxial surfaces.